Technology is always increasing, I think about the toys I got excited about as a child, they don't compare to the toys my kids get excited for today. We can only imagine what their children's toys will be like. Playing with my grandchildren and great-grandchildren will be exciting for sure. WowWee has hit the market this holiday season with some awesome toys. We had the opportunity to review the COJI. COJI is a cute little robot, who provides children with hours of imaginative play and they learn about programming in the process. 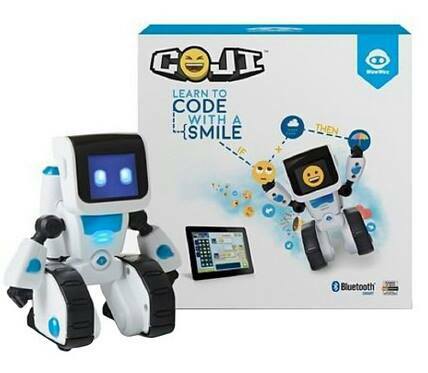 COJI teaches children the basics of programming using a language they already know, emoji's. Isn't that great, right now emoji's are a big deal. The skill testing games encourage critical thinking. Even young readers will have fun stringing the smiley faces together. An app is used to control COJI'S actions and solve different problems. The longer children play the better they become at programming. COJI can be used without the app but it's definitely more fun using the app. You could can download the app for free on any smart device. To power up COJI you'll need 3 AAA batteries. There's no wrong way to play with COJI, children won't be stressed by a mistake. COJI keeps things fun and exciting. Children can play games that test their memory, builds STEM and problem-solving skills. My grandson is really into playing with COJI, and determined to learn from this awesome little robot. He' s in awe that the robot will actually respond to him. He's very much into any and everything technology. WowWee designs develops markets and distributes Innovative robotic toys and consumer entertainment products. They're astonishing imagination sets them apart from the rest. You can connect with WowWee via , Facebook , @WowWeeWorld , You Tube , and WowWee Website . This is so cool! My nephew is in first grade and really into robots and programming. (I can't believe they are learning programming in First Grade-so awesome.) This will be absolutely perfect for him for a holiday gift, thanks!